, corresponding to amino acids 22-31 of Mouse GnRH. Our Abpromise guarantee covers the use of ab16216 in the following tested applications. ab16216 has not yet been referenced specifically in any publications. Publishing research using ab16216? Please let us know so that we can cite the reference in this datasheet. Dear technical support: The customer would like to perform ELISA in chicken samples. He would like to detect GnRH level in chicken brain samples. However, there is no suitable antibody for him. Datasheet of ab5617 shows immunogene: Synthetic peptide: EHWSYGLRPG (Human). He would like to know the homology of this peptide across chicken. Cold you please help him to check the sequence homology between human across chicken? Thank you very much for your assistance. Thank you for contacting us. Both the ab5617 and ab16216 are raised against an immunogen synthetic peptide of HWSYGLRPG corresponding to amino acids 22-31 of GnRH. 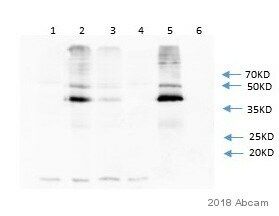 Comparing this to the corresponding sequence of Chicken GnRH (Swiss-Prot number P37042) reveals 8 of the 9 amino acids of the immunogen match exactly. We would therefore expect these antibodies to detect chicken GnRH. However, neither of these antibodies have been tested against chicken or with ELISA. Therefore, I can offer a discount off a future purchase if you buy either ab5617 or ab16216 now, test it in chicken with the ELISA and submit feedback to us in the form of an Abreview. It doesn’t matter whether the Abreview is positive or negative, we would just really like to receive your feedback. The discount would be to the value of 1 free primary antibody. If you are interested in this offer, please follow these steps: 1. Reply to this e-mail to let me know that you would like to proceed and test either ab5617 or ab16216 in chicken with the ELISA. I will then send a discount code. This code must be issued before purchasing ab5617 or ab16216 so please wait for my reply before ordering. 2. Purchase either ab5617 or ab16216 either by phone, fax, or online (www.abcam.com). 3. Test it in chicken with the ELISA. 4. Let us know the results, positive or negative, using our Abreview system (this will take about 10 minutes and images are great if you have them!). To find out more about our Abreview system, please visit: https://www.abcam.com/abreviews. 5. After the review is submitted to us, the discount code becomes active. Simply place your new order by phone, fax, or on the web and mention the discount code. The discount can be redeemed for any primary antibody ordered and the discount code is valid for 4 months after issue. We are always pleased to obtain feedback about our products and any information is greatly appreciated! Even if either ab5617 or ab16216 turns out to be unsuitable for chicken with the ELISA, you will still receive the discount on your next purchase after your Abreview has been submitted. Please let me know if you have any questions about this offer and I would be happy to help you further. The Terms and Conditions of this offer can be found at: www.abcam.com/collaborationdiscount. I hope this information is helpful to you. Please do not hesitate to contact us if you need any more advice or information.